2014 brought all manner of good things my way. 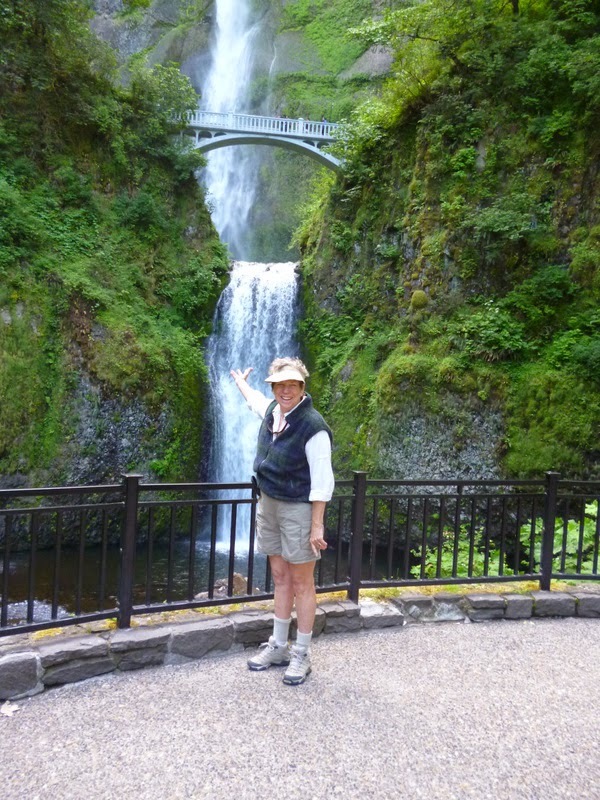 My journey with New England Hiking Holidays in the Columbia Gorge and into the Mt. Hood region of Oregon ranks very high on my not to missed adventures. In Get some Forest in your Boots I share highlights. Get Some Forest in Your Boots! From there I drove to the coast of Oregon where I explored trails on my own. 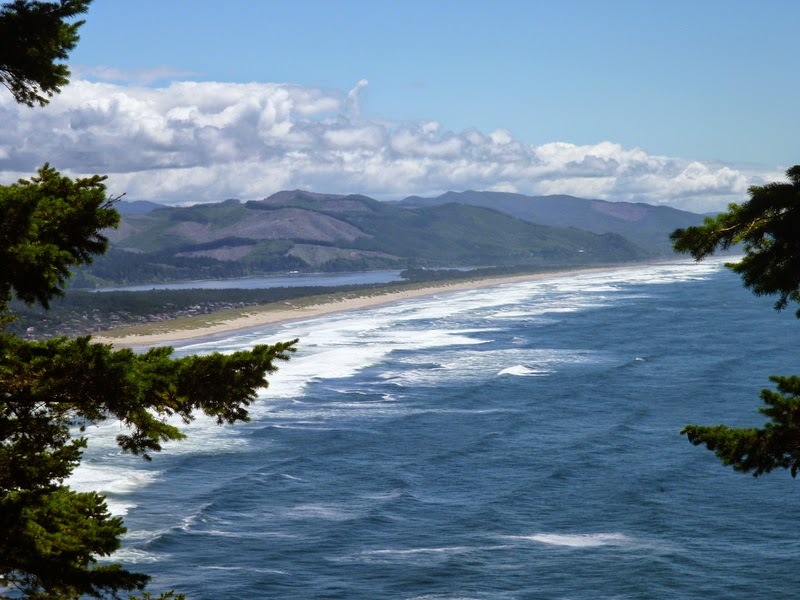 The Oswald Park below Cannon Beach was my favorite hike but, If You’re Looking for a Cozy, Friendly Community, With Mammoth Trees, Walking Trails and Whale Sitings, You Won’t Want to Miss Yachats — Gem of Oregon’s Central Coast. December found me in the Hawaiian Islands linking up with two local authors to form the Aloha Trio. 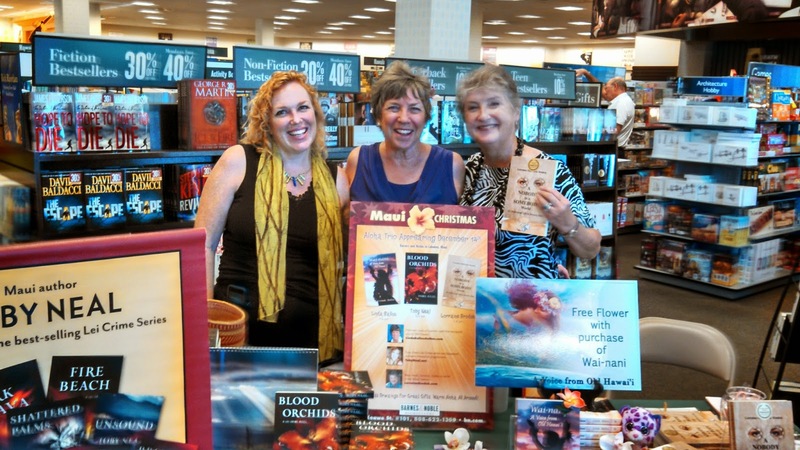 Together we shared our wares at Barnes and Noble in Lahaina, and at the exclusive Coast Gallery in Hana. Such warm aloha for Wai-nani, A Voice from Old Hawai’i made my heart sing. 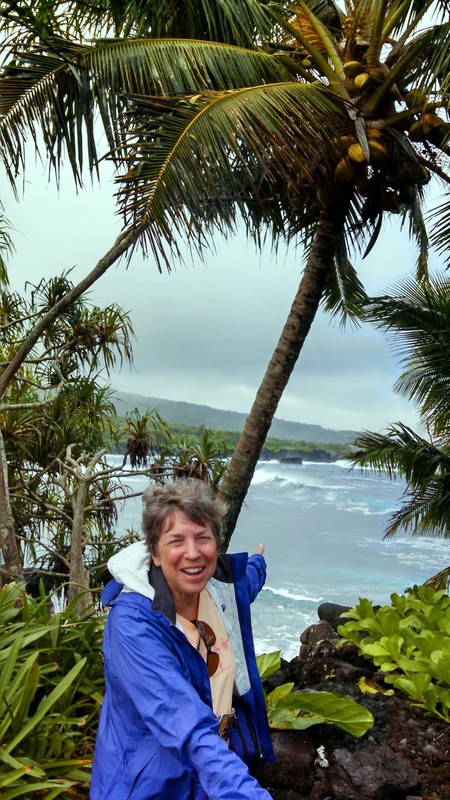 I was invited to stay with fellow author Lorraine Brodek who lives in Hana. She arranged for me to canoe to the birthplace of Ka’ahumanu, the powerful woman in Old Hawai’i, that inspired my novel. Watching my life unfold in ways I had never dreamed of is quite magical. 2015 promises to be filled with more exciting adventures that I look forward to sharing with you in my articles. 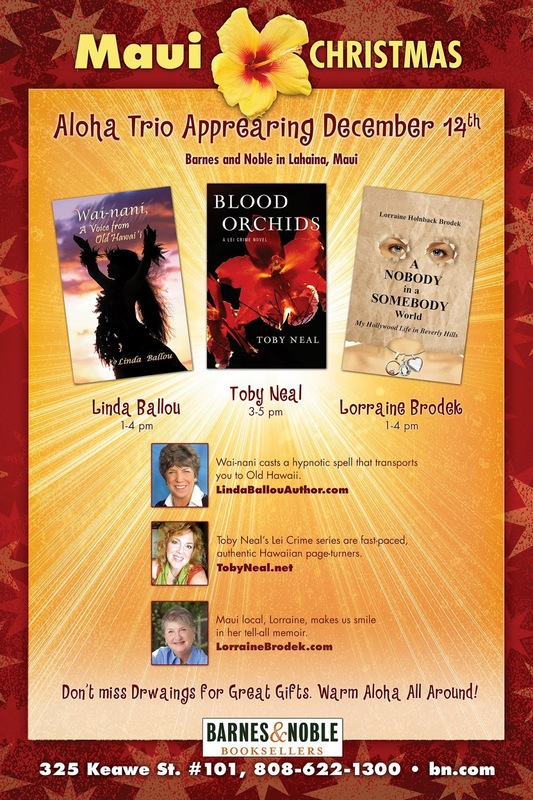 I’m off to Maui to meet up with the Aloha Trio for our book signing at the Barnes and Noble in Lahaina on Dec. 14th. I met hugely popular Toby Neal, author of the Lei Crime Series, online. I found her writing to be crisp, contemporary and fun. According to Toby, born and raised in the Islands, my book Wai-nani, A Voice from Old Hawai’i “Casts a hypnotic spell that takes us to ancient Hawai’i. Coming from Toby, someone with an intimate knowledge of the Hawaiian culture, this is quite an endorsement. I was having lunch with book guru, Carolyn Howard Johnson, here in L.A. and she introduced me to Lorraine Brodek, author of A Nobody in a Somebody World. Lorraine's book is filled with insider juice on Hollywood celebs she grew up with in Beverly Hills. Being a Hawaii aficionado, my personal favorite is her rendering of her life in Hana, one of the last enclaves of old Hawai’i, where the threat of wild pigs calls for a luau. Lorraine read Wai-nani and said “The rhythm of Linda Ballou's writing is sheer poetic dialogue. Her descriptions are as mystic as the ancient Hawaiian culture she so graphically describes in this wonderful story that she tells using the voice of Wai-nani (aka Ka'ahumanu, King Kamehameha's favorite wife). Chiefess Ka'ahumanu's birthplace was in a cave at Puu Kauiki in Hana--a hill that exists today in this charming town that truly evokes the beautiful spirit of old Hawaii. 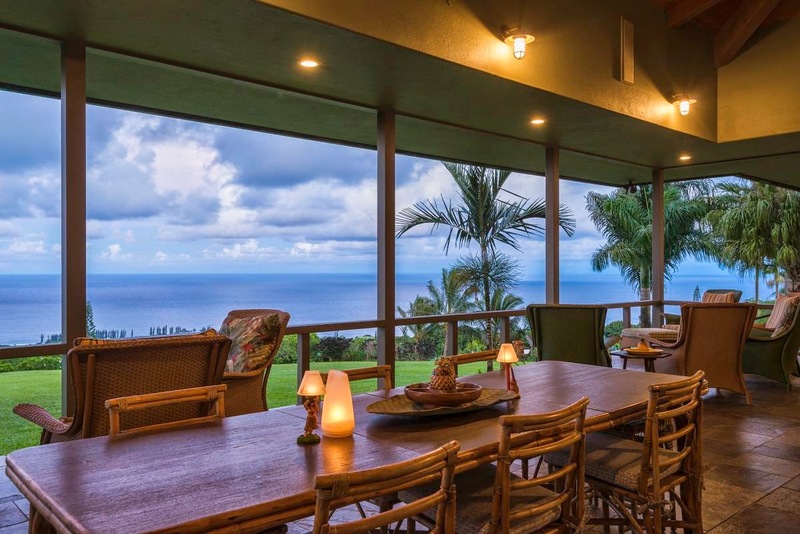 We became friends and Lorraine invited me to stay at her exquisite home high on a knoll overlooking Hamoa Beach in Hana. How could I say no? Being a person who gets things done, Lorraine arranged for us to have a reading at the Coast Gallery at the luxurious Travaasa Hotel Resort on Dec. 17th, . 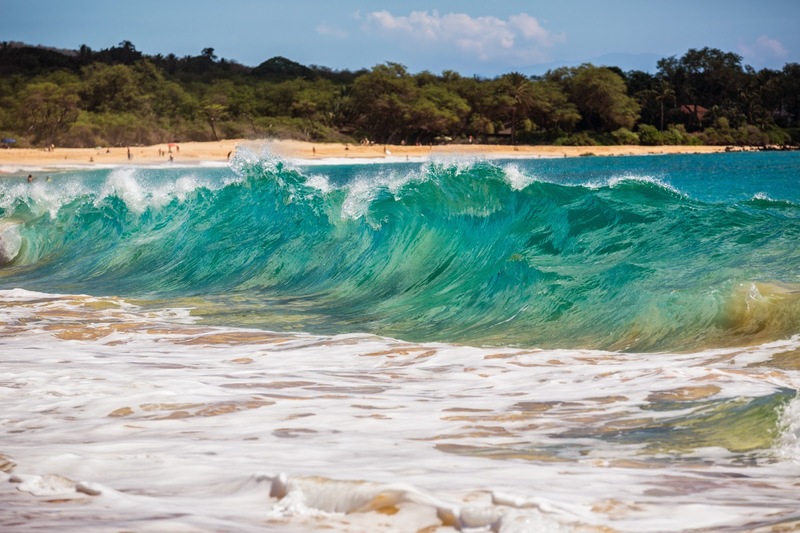 Writing the Hawaiian story became a beautiful obsession for me that spanned twenty years. I had no idea where it would lead me, or the doors that it would open. I can only say I am grateful for what has come my way. Wishing you all a very Maui Christmas with warm Aloha-In the name of Wai-nani.